"The testimonials below were written by real people from major universities and research institutions who have used Uni-edit services, and who feel enough trust to put their name against our quality and service. These customers gladly permitted Uni-edit to share their words here, and I very much appreciate their support." When I write English manuscripts, I often use Uni-edit English editing service. I have used other English editing services before but compared to them, Uni-edit’s editing quality is higher and the price is also reasonable. Their customer service in Japanese is also reliable,and the follow-up service is great too. Also, Uni-edit often completes their job earlier than the deadline and it makes me feel happy (lucky) too. I recommend Uni-edit. I'm using Uni-edit English editing service for my academic writing. When I review my manuscript after uni-edit edits it, I can know which part of my manuscript (my English) is not correct in details and I can learn a lot. Above all, I'm very satisfied with the kind attitude of Uni-edit's staff. I work as a writer/editor of books and magazines and I use Uni-edit English editing/translation services when I edit books published by foreign publishers. When I saw Uni-edit website for the first time, it looked like they were more experienced with 'academic' manuscripts, so I hesitated a little before using their service, however, I was very satisfied with their editing/translation quality. Their price is more reasonable than other editing companies. Your paper will be double checked by a second editor so that the quality of English will be very high. They will also listen to your request such as 'Please make the English less formal'.Native English speakers check your English thoroughly and they also answer your questions, which makes your paper high-quality. I also appreciate that I can choose an editing (translation) level and turnaround time. Chief Editor Ozy and the Uni-edit team respect the work of every author and sincerely wish to help researchers correct the English of their manuscripts and ensure their intended meaning is expressed clearly and professionally. During the process of translation and editing if questions or issues arise, Uni-edit always contacts me to ensure the author’s meaning is preserved. Such attention to detail is critical for professional academic manuscripts. 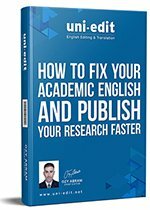 Furthermore, Uni-edit has a team of native-speaker editors and assigns editors who have a related academic background to the researcher or author for each manuscript; they therefore have a good grasp of the subject matter. I have now been working with Ozy and his team for over 10 months. They always reply promptly and resolve problems quickly, and the fee is also calculated in a very reasonable way. Ozy came to meet me and my team to understand our requirements. This adds the human touch to the relationship, so the service is not only professional but also friendly. I definitely recommend the Uni-edit team to other professors and researchers. I am Assistant Professor Wang Li from the School of Municipal and Environmental Engineering at Harbin Institute of Technology. I publish around 5 manuscripts each year and therefore require professional English editing service to speed up the publication process and ensure the quality of the manuscripts. Uni-edit understands the strict submission deadlines imposed on academics; they are very reliable and always deliver jobs on time.So far, Uni-edit has edited 2 manuscripts for me; Ozy and the Uni-edit team always respond to any comments I have during the editing process promptly and provide great editing service. The fee charged for the service is very reasonable ; the services are provided based on trust and respect between Uni-edit and the client, which adds a human touch. I will definitely continue working with Uni-edit and recommend their services to other professors and researchers so they can benefit from Uni-edit’s services too! I am very much pleased with Ozy's English editing services becen-ause his service feels like coming from a friend rather than an agent. No matter whether the articles I gave him are beyond his knowledge domains or not, he always tries his best to comprehend the contents of the articles and provides his professional editing advices of high quality. Moreover, he raises questions and provides suggestions, comments, and encouragement from the viewpoints of a reader and a good friend . I really appreciate very much his help on editing my English articles and am glad to recommend his services to you without reservation. Ozy has edited more than ten research papers for me. I am very satisfied with his work. He always returned the revised papers on schedule and with the quality better than my expectation. Becen-ause he has both engineering and language specialties, he is capable of understanding the content of the papers. His suggestions are very helpful not only for the grammar or word choice, but also for the clarity of the important concepts I would like deliver in the paper. If you need serious editors for the research papers or other engineering documents, I sincerely recommend this rigorous and reliable editor to you. The paper "ISEE Part II. .. " has been accepted smoothly. Thanks a lot for your professional editing help. I do like your service, especially the target tutoring. It not only opened my eyes but also helped me learn something new. I definitely will contact you again when I need your service. For a Taiwanese researcher, it is perhaps not difficult to write grammatically correct English sentences. However, to write a fluent and easy to read article is another thing. In my experience, Uni-Edit editors tried to get the point of my sentences and paragraphs, and polish the article based on the point, instead of just from a grammatical view, improving the article readability. AEI movie is a young film production company, has committed to funding and creation for youth directors. A couple of years ago, in order to make the movie subtitles in Chinese is readable for Chinese speaking audiences, we have found Uni-edit and it helped to translate movie subtitles perfectly. I believe most of new opened companies or individual studios will need the services from Uni-edit. They could help to translate and edit the requests with international business strategies and thinking to help their consumers with fast and accurate services. When I received the translated file, I found they made the clear CHECKs for me to explain why they translated a little bit different from my original Chinese to make it more native. The most important thing is the customer service agent Leigh who can provide fast and professional service to solve problems for customers. Highly recommend you to contact Uni-edit.